Raise your hands for humanity. Cyclone Sidr has damaged a lot. Both of wealth, life and alos dream. Most affected people are very poor and they just alive because of there dream. But their dream has breaked up. They loose everything. They loose their house, money, wealth which they have. They lost their dear ones too. They lost their crops or what they have. They lost everything they have. But your contribution can make this t hings different. Loss of life can’t and never be fullfilled. But their loss of wealth and dream can be fullfilled so they can get some reason to be alive. So please help those poor helpless people. Please come forward and help them.Help them by giving what you can. Help them by your abilit. Your small hep can bring large change in their bad situation. Help them to stand again. It’s your chance to help some poor people.Please help them. Please. This pictures are collected from various website arround the World. Bangladesh has called for more aid for tens of thousands of Cyclone Sidr survivors, amid concerns that some remote areas have not yet been reached. Bangladesh has called for more aid for tens of thousands of Cyclone Sidr survivors, amid concerns that some remote areas have not yet been reached. 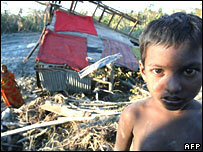 The country’s army says it has yet to deliver aid to 30% of coastal villages hit five days ago by the storm. There is anger among many villagers on the stricken south coast that they have still not received vital supplies like food, water, shelter and medicine. The storm has affected 1m families and killed at least 3,100 people. The BBC’s Alastair Lawson, at Bangladesh’s storm-stricken Sunderbans mangrove forest, says aid is beginning to get through and army helicopters are criss-crossing the skies.